First of all, A massive thank you to the community here on eGPU.io you guys have been a world of help getting this all up and running. I have the node plugged into a dell 4K display and everything seems to be working great. No issues with putting the mac to sleep when the eGPU is enabled. I did initially have some lag with UI elements when I first plugged in the display, However this was caused by the internal display still being rendered (Know issue). Seeing how I want to use the mac in "clamshell mode" I utilised the disablemonitor application to disable the internal monitor which got rid of the lag. I'd recommend closing the lid of the mac after you've disable the screen otherwise you may find some lag on startup with the lid closed. You can get final cut to work by moving the driver files for your integrated gpu out of the extensions folder. However this will remove the ability to get hardware acceleration from the integrated graphics. So this means when I reboot my MacBook Pro without the eGPU I get NO hardware acceleration. I've made an AppleScript application to enable and disable the iGPU (See below) which is working well for me and makes turning off the iGPU Painless. 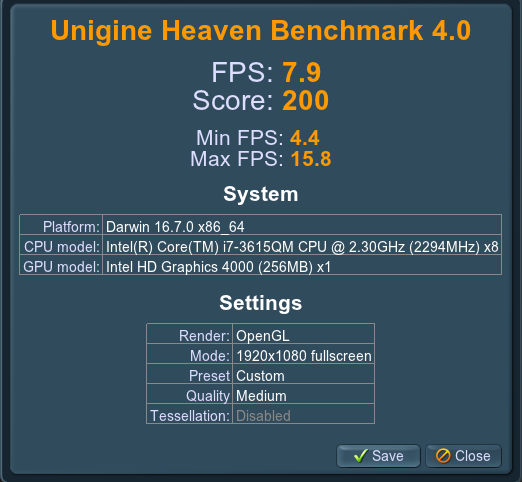 I ran the benchmark a total of 7 times and there were no issues at all. I am only including the last 3 results as I messed up the first 4 (wrong format / had other apps open). @jonwatso similar results for me on FCP on an RX 480 4GB. Interesting to see that kext file mods for iGPU-only macs are a necessity to get FCP working. Not the case with all macs w/ dGPU. Great write up! Yeah I am pretty disappointed that deleting the Kext files is the only way to get final cut to work as everything else works great. It was the same story in Lightroom. I would've preferred if the iGPU and eGPU worked together. Oh well it's a good work around in the mean time albeit a bit messy. I've made a fairly basic script that enables and disables the internal iGPU. It does this by first backing up the igpu driver files and then deleting them from the extensions folder, and then copies them back when enabling them. I've written it so that it always makes a backup before making any changes. I've tested it on a couple of macs and seems to work great and makes enabling / Disabling the iGPU super easy. You can open the app in apple script so that you can modify it and make it work with your Mac's iGPU. It's currently set up for the Intel HD5000 igpu so you will need to modify the script if you want it to work with other macs, just use the find and replace function in Script editor i.e replace "HD5000" with "HD3000". I've tried and tested it on my 13" MacBook Pro late 2013 without any issues. SIP Needs to be turned off for this script to work. Disclaimer: The script is setup to always back up first before making any changes, However you are using this script at your own risk and I am not responsible for anything that may go wrong. I hope you find this little tool helpful. Chances are your Mac will utilise one of the Driver bundles below as of 10.12.4. So for example if you are doing this on a new 2016 MacBook Pro I would write; Replace “AppleIntelHD5000” with “AppleIntelSKL” and then go Save > Save as Application. 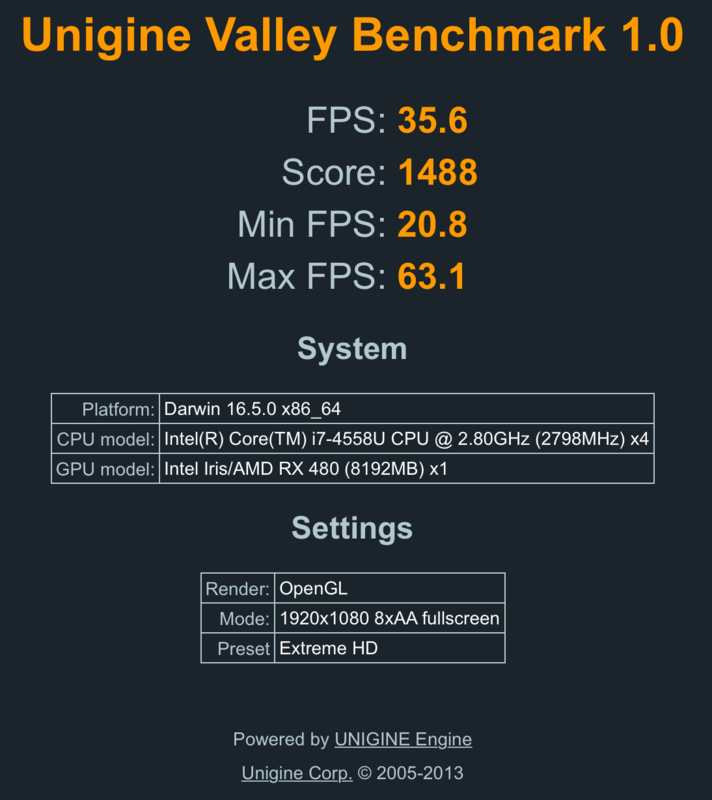 Here are a bunch of benchmarks from my eGPU. The main goal for these tests was to find out how much of a performance gain I was getting over my integrated graphics rather than comparing them to other systems / cards. For the iGPU all the tests are done on the internal screen and with the eGPU all tests are done using my dell 4K Display. Due to that annoying bug on Mac OS I had to run the GPU benchmarks in 1280x800 to get the full screen mode (on the internal screen). Overall I am very happy with the GPU performance gain that I got from adding an eGPU to my setup. 25 degrees cooler? Holy s***. Yeah it's a pretty decent change! 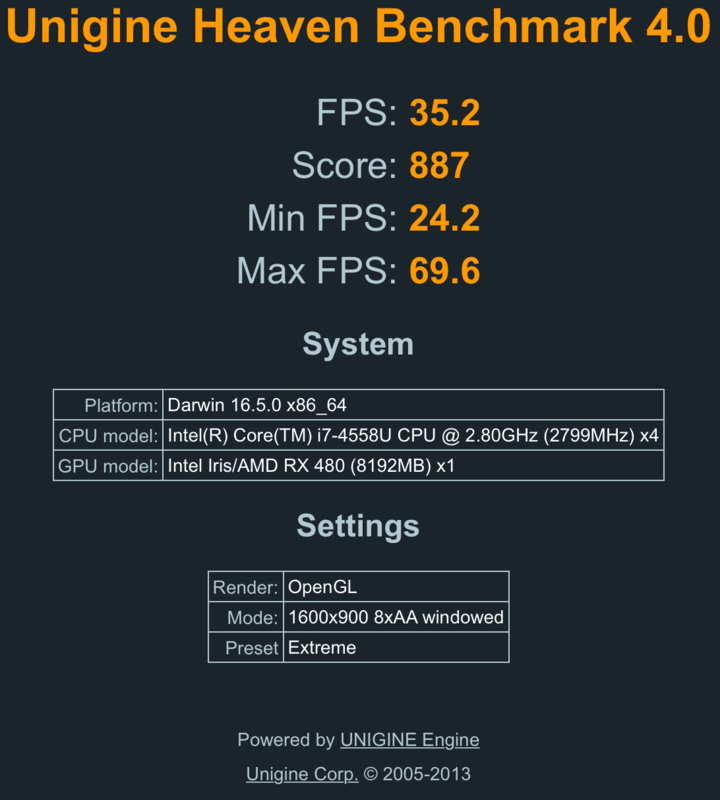 I guess the iGPU being on the same chip as the CPU causes the massive difference in heat. 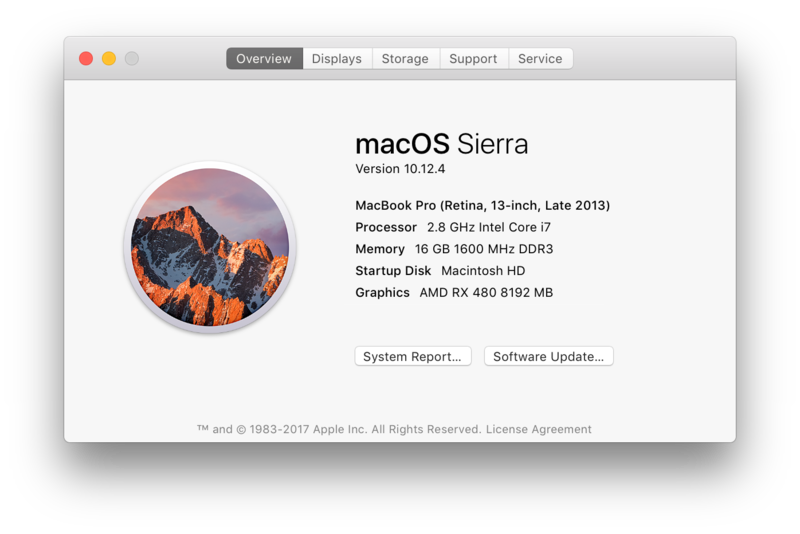 If anyone is curious, As it currently stands the setup works flawlessly in High Sierra 10.13, However the deletion of the driver files is still requried to get final cut to work though I would say this will change after 10.13 is officially released. This will most likely be resolved in a future update to FCP/macOS. The most interesting aspect of this is that, at least on dGPU macs, I hope that instead of load overflowing from discrete to external graphics, both chips are optimally used. I can't wait for Final Cut to work without deleting any system files. 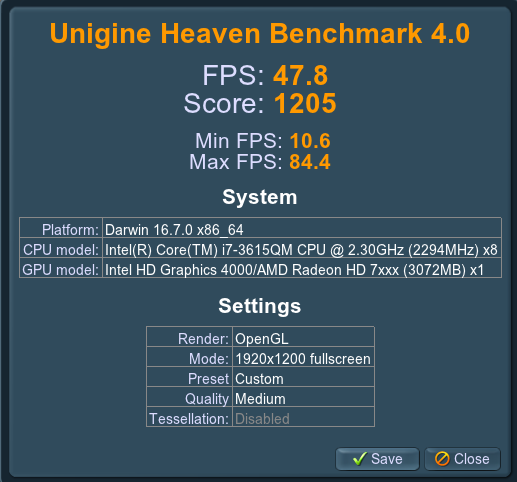 I hope you're right with the optimization of utilising both GPU's. 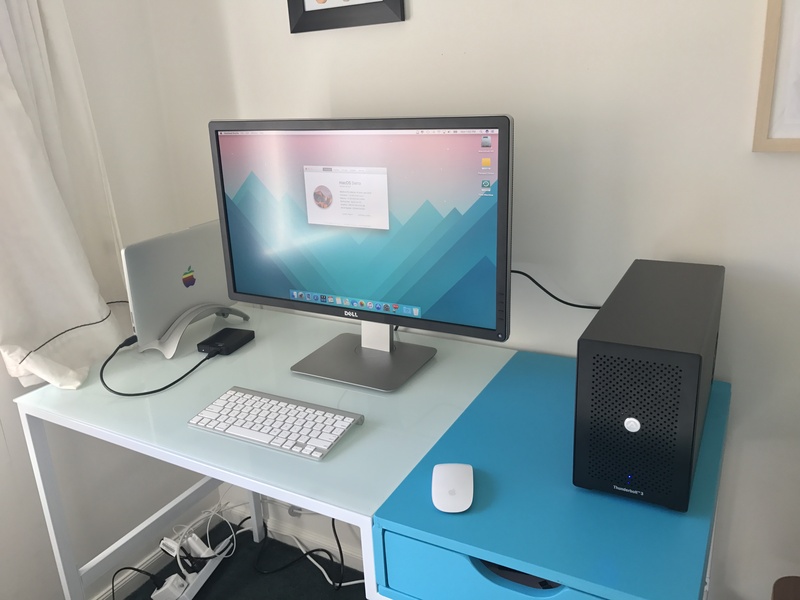 Given what I've read / seen on developer.apple.com it looks like this may be how eGPU's are utilised. Time will tell. Exciting times. I have a brand-new setup with a aorus 1080 and a 2015 macbook pro 15" iGPU only running MacOS 10.12.6. I followed both goalque's and rasta's guide but at the end the system would see the GPU but not use it for acceleration. The first clue was that Photoshop wouldn't let me choose the 1080 under GPU selection. Other graphic applications would also ignore the eGPU. Games like League of Legends were the same. The only software that worked from the start was a game called Bioshock, which I had bought from the App Store. I genuinely wonder why. First off I have to say it is pretty weird that I had to actually look for a solution for this. I'd imagine more people to have faced the same issues with an iGPU-only machine. Well I've used your clever script for disabling the iGPU and BAM, worked. Now Photoshop sees the 1080. However, I was hit with a MAJOR UI lag in the external monitor. Again following your advice, disabled the internal screen at it is now flawless. However, why wouldn't my 1080 be able to accelerate both displays? I would really like to use 2 screens. Are you aware of a workaround for that? sorry for the late reply! I believe its due to the limited bandwidth of the thunderbolt connection and because of this, it is unable to accelerate both screens. I would love to see this changed. I believe once eGPU support is officially implemented this year we should see better support in things for applications like photoshop etc. My recommendation for multiple displays, is to simply plug two displays into the eGPU as it is more than powerful enough to run multiple displays. Hello, hope that someone could give an advice, Since yesterday when I started the Mac Mini and the Akitio Node, it works just for few minutes, as soon as I opened youtube it went to blank screen, I restarted and i happened the same.. I plug it to my macbook pro and same problem... ANY IDEA? @ramses-abascal The issue might be with your HD 7970 rather than the AKiTiO Node. @jonwatso Hi, I downloaded your iGPU tool but nothing seems happen in my early-2015 MBP 13'', internal graphic card can't disable after reboot. Is it the problem what I updated the latest MacOS Mojave 10.14.2 beta? I would like to use internal display with eGPU acceleration, but my PS cc 2019 can't recognize the eGPU...Rx460, could you please give me some advice?